Books Unlocked provides free copies of Man Booker Prize-shortlisted titles for participants to read, discuss and keep. The authors of these titles regularly visit prison and community reading groups as part of the programme. Books Unlocked is supported by the Booker Prize Foundation. A key part of the Books Unlocked programme is our work with National Prison Radio. National Prison Radio is a free radio service broadcasting directly into almost 80,000 cells in prisons and young offender institutions across England and Wales. We work with them to serialise audiobooks of the Man Booker Prize-shortlisted titles, as well as broadcasting author interviews. 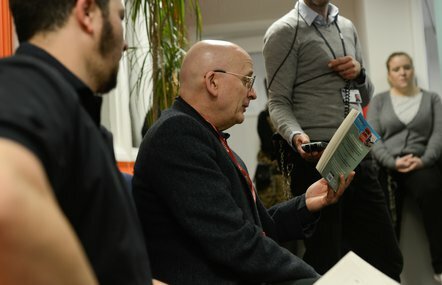 A collaborative reading project has been helping to break down barriers between prisoners and their local community through shared reading. In 2015, we expanded Books Unlocked into local communities. Alongside our work in prisons and young offender institutions, we now work with community reading groups, libraries and schools to encourage them to read and share their thoughts on the Man Booker Prize-shortlisted titles. Participants’ thoughts on the books are then anonymously shared among all reading groups in the area. This allows different communities – whether in a library or a prison – to engage with the opinions and views of others. If you'd like to take part in Books Unlocked, please email us.